This topic contains 7 replies, has 1 voice, and was last updated by gurusid 5 years, 10 months ago. In the current Zombie economy it is hard to spot what is going on as regards inflationary and deflationary influences. So here is an attempt to ‘join the dots’ of the current deflationary influences here in the UK. Falling wages are having an impact on the standard of living; UK wages have fallen 3.2% while Germany’s have risen by 2.4%. over the last couple of years. This lack of real cash in terms of wages to spent in the economy is a big deflationary pressure, without it consumers cannot consume. On the plus side, as the UK manufactures so little it reduces imports which might help the balance of payments if the pound wasn’t devaluing. Overall a substantial majority of the 105,000 were likely to be subsisting on unemployment benefits – given that several DWP schemes are entirely unpaid – and only a minority of people on the work programme would have been in paid work placements. Further Education Corporations and Sixth Form College Corporations in England were recorded as public sector up to the first quarter of 2012, but have since been classified as private sector. The Office for National Statistics (ONS) estimate that private sector employment figures have been inflated by around 196,000 jobs as a result, and guess what? If you redistribute those jobs to the public sector, his claim is no longer true. The increase in private sector jobs between the second quarters of 2010 and 2012 was 1.07 million according to the latest figures from the ONS, but this falls to 874,000 when the educational bodies are moved back to the public sector. Also due to the withdrawal of social security benefits more people than ever are chasing fewer jobs, despite claims of a million new jobs ceated with no corresponding increase in GDP; and downwards pressure on wages, the figures just don’t add up. Coupled with further stealth withdrawals of benefits with such things as capping the total amount payable to a family and the “bedroom tax” and there is a very significant withdrawal of money directly from the population, and from those at the bottom end of the scale who are most likely to spend that money direct into the economy. There has also been a large increase in those in work applying for help such as housing benefits due to large increases in rent. If society desires a higher level of employment and output, then the only way to get it is to reduce the real wage (and the logical limit of this argument is that output will reach its maximum when the real wage equals zero). (Keen, 2011, “Economics Unmasked”, p.121. Even if wages were to go to zero, exports would not necessarily increase as for one who would you export to? As most of the material for any (non-existent) manufacturing process would have to be imported with a devaluing currency and increasing transport cost. With a further decline in home consumers, you would face the same dilemma as China whose own internal market is spluttering. People tend to forget that China’s growth was gained on the back of debt ridden western consumerism, something that is fast becoming history. Further other government spending cuts have been reassessed by the IMF to produce a bigger “multiplier effect”, going from 0.5 to 1.5 times. Thus instead of a reduction in government spending of £1million having and actual effect of £500,000 it is now calculated as having an effect of £1.5million. George Osborne’s drastic deficit-cutting programme will have sucked £76bn more out of the economy than he expected by 2015, according to estimates from the International Monetary Fund of the price of austerity. In the letter, which the OBR has published on its website, he said calculations based on widely used academic calculations that austerity has reduced economic growth by 1.4% in 2011-12. In this simulation, a country with a 120% of GDP debt ratio reacts to a negative shock to its economy by going for a fiscal squeeze of 5% of GDP over one and half years, and with the entire consolidation being based on public spending cuts. The result is that debt continues to explode. The reason for this has to do with the ‘denominator’ effect. Even if the annual deficit (which is part of the nominator) is being reduced, this consolidation policy triggers a prolonged recession depressing nominal GDP (which is in the denominator), thereby pushing the debt to GDP ratio up, not down! After four years, the debt to GDP ratio is still 14% of GDP higher compared to another scenario in which the consolidation is done in a gradual way and equally based on expenditure cuts and tax hikes. So by cutting government spending they may have cancelled out any effect that quantitative easing might have had on the real economy, bit like sitting on an economic whoopee cushion. However, these reductions in benefits are a classic sign of contraction as discussed on the TAE and in Joseph Tainter’s “Collapse of Complex Societies”. Parliament Briefing:After spending most of the previous 25 years as a net exporter of energy the UK became a net importer in 2004. The gap between imports and exports has increased since 2004 and this looks set to continue to increase in the future. This, alongside higher fuel prices and increased concern over the security of energy supply has increased the attention on energy imports and exports. Also prices will eventually start to come down as affordability falls through the floor crashing demand. As the local economy tanks, even cash rich outsider investors who have kept local process high buy pouring in external investment will take fright and pull out. This is exactly what has happened post de-industrialisation in the north, where a distinct north/south divide exists. The benefit cuts are also more likely to affect the north due in part to the higher unemployment levels. Also at the other end of the scale, new regulations regarding the so called pay day loans could restrict these ‘Vinny the Knee Capper’ style loans, no bad thing as their equivalent APR’s can be as high as 2,670% and ‘Vinny’ ensures that the debtor remains in debt, but while its another constraint on credit, the cash saved on extortionate interest payments might balance things out. The Office of Fair Trading has now confirmed what many of us feared. Legal loansharking is out of control in Britain. The myth there are simply a few rogue firms has been blown apart by their description of “widespread irresponsible” behaviour. The OFT’s devastating analysis reveals just how they benefit from getting people into debt, with 50% of profits being generated by consumers rolling over loans and racking up costs month on month. Crucially, the OFT outlines problems not simply to do with compliance with existing regulation. They are so fed up with the conduct of these companies they have announced their intention to refer the lot to the Competition Commission. For any other government this would be a wake-up call that urgent reform of this market is needed. Nearly 5 million people are borrowing in this way and the cost of living crisis in Britain is going to get worse, not better, in the months ahead. Yet despite these practices they continue to resist capping what these companies charge. The case for capping is overwhelming – countries with these measures have lower levels of illegal lending as well as lower levels of personal debt. Yet the government listens only to the industry that claims caps could stop them lending – just as turkeys claim Christmas is a bad idea. This stance now makes Britain one of the few places in the world where consumers can be charged extortionate rates of interest without any form of redress. In a nation where wages are stagnating and prices are rising, many will find themselves with too much month at the end of their money. To restrict their access to credit would cause more financial distress. Yet, to only offer this toxic form of expensive credit is hardly better. Regulating costs, requiring all lenders to do proper credit checks and changing the way in which continuous payment authorities work would help reduce the pressures these loans are creating for millions of families. Some commentators have drawn parallels with the Japanese situation of the last twenty years, in which growth has been sluggish and investment low as both companies and individuals have hoarded cash, and where the government has been the consumer of last resort. However these commentaries have been blaming the lack of ‘structural reform’ and not the deflationary forces of a deflating stock and property bubble from way back in the late 1980s (a reminder of the hangover period of excessive bubbles), though deflation is mentioned, that and the fact that the crisis in Japan has led to a generation of more conservative investment thinking. Also Japan still has an active manufacturing base while the UK’s has been vastly reduced, leaving it in 9th place globally below France, and just above India. Japan is third. When it comes to political will, the UK is leagues ahead of Japan. But elsewhere, the parallels are eerie. Japan’s economic problems are well-rehearsed. The world’s third largest economy has national debt of 236pc of GDP, and a budget deficit of 10pc. The UK, by comparison, is a bastion of fiscal rectitude, with national debt of 88pc and an 8pc budget deficit, using International Monetary Fund numbers. If that was not unsustainable enough, Japan’s ageing population is piling even more pressure on the public finances. A decade ago, social security expenditure was 12pc of GDP, it’s now 24pc. In the same time, tax receipts have dwindled from 30pc to 28pc as the workforce has shrunk. The system is crying out for reform, but there is political stasis. The two main parties have agreed to balance the primary budget no earlier than 2020, having struck a cross-party deal to raise VAT from 5pc to 10pc by 2015. It is not enough. The IMF says VAT needs to rise to 15pc and welfare reform, of pensions and medical care, is long overdue. Policy has also trodden a similar path. Rates have been cut to near zero, central banks have printed money and tried “credit easing”, governments have looked to infrastructure to cure slow growth, and there has been a rapid rise in the non-regular workforce – in the UK, part-timers and the self-employed. The young have been disenfranchised. The UK may have recapitalised the banks faster and started printing money earlier, but policy action has been largely the same. The big difference so far, has been deflation. At the same time, deflation has made it desperately difficult for companies to manage their costs. The response has been dramatic. Japan, which was one of the last torch-bearers for jobs-for-life, now has the largest proportion of “non-regular” contract workers – with little employment rights and reduced career prospects – in the industrialised world, Shiseido director Carsten Fischer says. Another set of subdued GDP figures has begged an old question: is Britain turning into Japan? The difference between the two economies is in many respects still so great as to make the question seem almost laughable. …There is no surer way of ending up in the Japanese trap than by further piling on public debt, and thereby permanently crowding out private sector activity. It is in any case wrong to think that deficit reduction is the cause of the present hiatus in the economic recovery. In fact, government spending continued to contribute positively to growth in the first quarter. Deficit reduction is merely a way of insuring the UK against the massive economic dislocation which would be caused by a sovereign debt crisis. Lower medium-term growth is part of the price that has to be paid for putting the economy back on a less risky footing. Far from condemning the economy to a Japanese-style funk, where private sector activity is done lasting damage, sticking to Plan A offers part of the solution. Nobody could think it acceptable for the state to continue providing nearly a half of all economic activity. Yet to ensure the private sector picks up the baton and runs with it requires a much bolder approach to supply-side reform than the somewhat underwhelming set of measures we have seen to date. Japan’s failure to tackle structural reform is one of the main reasons for its continued state of economic paralysis. Britain doesn’t have to become Japan, but it will require political nerve to avoid it. In the UK people are realising that saving is again an option (if they have any money to begin with) such as trying to save for that enormous deposit for a (currently) overpriced house, and starting to hold onto money as a cushion against hard times as the welfare state disappears, this is further going to stall the money flows in the economy. Global deflationary trends aside, the UK is experiencing many deflationary forces, and this is before major debt defaults through rising interest/unserviceability of debt kick in. The disappearance of credit seen so far could portend the return to the days of only the privileged having access to credit, something already discussed at TAE. Also cutting taxes and cutting benefits is a deflationary policy by default, as the first takes money out of the real economy and puts it into the hands of people who more often that not will squirrel it away in some investment fund or offshore account, and the latter deprives people who would otherwise spend the money directly into the economy on essentials. But then cutting the government deficit is also paramount. It’s an impossible situation, enough to drive a headless chicken mad. Still at least there is growth in one area, food banks are thriving. 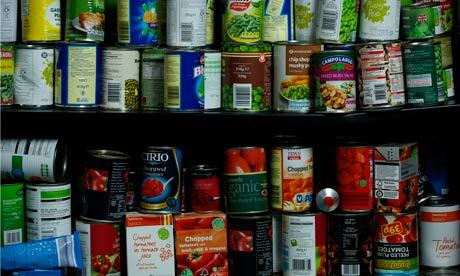 Volunteers rallying to distribute food aid to those who can no longer afford to put a meal on the table isn’t the big society David Cameron planned. Ultimately all the pointers are telling us we’re already in a deflationary environment. Inflation in Greece was negative last month for the first time in 45 years. That is because prices are being pushed down by the country’s deep recession. Consumer prices fell by 0.2 percent from March last year. Greece is in its sixth year of recession, hit by austerity policies imposed under a bailout from the European Union and International Monetary Fund which is keeping it from going bankrupt. The government is forecasting the economy will contract by 4.5 percent this year. Data on Tuesday also showed industrial output fell 3.9 percent year-on-year in February after dropping 4.2 percent in the previous month, underscoring the grim state of the Greek economy. “Negative Inflation” 😆 Anything but ‘deflation’ eh? The Government’s raft of controversial welfare reforms will take almost £19 billion a year out of the UK economy and hit northern England hardest, researchers say. Residents in the Lancashire resort town of Blackpool will lose out more than anywhere else in Britain when changes to the benefits system kick in, academics at Sheffield Hallam University said. Former industrial areas including Middlesbrough, Liverpool and Glasgow will also be disproportionately affected. However, wealthier areas, predominantly in the South, such as Cambridge, Surrey and the Cotswolds, will see the smallest financial losses. Researchers assessed the financial impact of changes made by the Conservative-led coalition to housing benefit – including the so-called bedroom tax on public housing tenants who have unused rooms – disability living allowance, child benefit, tax credits, council tax benefit and several other hand-outs. Generally, the more deprived the local authority, the greater the financial impact, Prof Fothergill found. He said the three regions of northern England – the North West, North East and Yorkshire and Humberside – can expect to lose a total of £5.2 billion a year in benefit income. Much of the south and east of England outside London escapes comparatively lightly. Researchers calculated the average amount that every working-age adult stands to lose in each region of Britain per year. This average figure allowed them to gauge how much each area would be affected. Working-age residents in Blackpool will lose an average of £910 each through welfare cuts. Westminster, with its high cost of living, will be the hardest hit London borough. Residents will be £810 out of pocket on average. However, the Department for Work and Pensions said the reforms will benefit the vast majority of working households. A Government spokesman said: “Around nine out of ten working households will be better off by on average almost £300 a year as a result of changes to the tax and welfare system this month. Raising the personal allowance to £10,000 we will have lifted 2.7m people out of income tax since 2010. “The Dutch government’s inability to acknowledge the damage done by austerity despite mounting evidence is a case of ‘cognitive dissonance’,” it told the Financial Times. As in Britain – or Japan when it buckled in 1990 – there is a long-term housing shortage. Rabobank says the overhang of unsold homes is 228,000. That is bad but not disastrous. The crisis stems from rampant credit, not rampant building. There have been quite a few bold predictions, since the beginning of the year, that the dollar was set to soar and that the great “bond bull market” was dead. The primary thesis behind these views was that the economy was set to strengthen and inflation would begin to seep its way back into the system. Furthermore, the “Great Rotation” of bonds into stocks, on the back of said economic strength, would push interest rates substantially higher. While I have no doubt that at some point down the road that inflation will become an issue, interest rates will rise and the dollar will strengthen – it just won’t be anytime soon. A wave of “disinflation” is currently engulfing the globe as the Eurozone economy slips back into recession, China is slowing down and the U.S. is grinding into much slower rates of growth. Even Japan, despite their best efforts through a massive QE program, cannot seem to break the back of the deflationary pressures on their economy. This is a problem that has yet to be recognized by the financial markets. The weak level of economic growth, global deflationary pressures, demographic trends and excess indebtedness which derails productive investment are keeping inflationary pressures suppressed. The real concern for investors, and individuals, is the actual economy. We are likely experiencing more than just a “soft patch” currently despite the mainstream analysts rhetoric to the contrary. There is clearly something amiss within the economic landscape and the recent decline in rates, the dollar and inflation are telling us that. “…Fifth, at the zero lower bound, risk management becomes extremely important. In particular, because the costs of getting stuck in a liquidity trap with chronic deflation are high, a central bank should put substantial weight on avoiding this outcome. …With deflation intensifying, the Bank of Japan embarked on a quantitative easing (QE) program in 2001 designed to increase the size of the monetary base. The Bank of Japan engaged in purchases of JGBs that were large in scale, but confined to short-dated maturities. This reflected a view that such purchases primarily acted through the liabilities side of the central bank’s balance sheet—pushing up the amount of reserves in the banking system. Because the growth of the monetary base was deemed the goal of policy, it was logical to purchase short-dated assets, which could be allowed to run off once a sustainable recovery was in place. …More than a decade after Japan’s bubble burst, the U.S. housing bubble burst. This exposed extensive vulnerabilities in our financial system and triggered a global financial crisis.6 Unlike Japan, we had the advantage of being able to learn from another nation’s recent experience. We applied what we understood to be the lessons from Japan, though with hindsight, perhaps not in every respect as completely as we could have. Heads up to TAE for telling it how it now is way back when. “The next major financial panic will cause a substantial deflationary wave first, and after that we will see unprecedented inflation as the central bankers and our politicians respond to the financial crisis. This will happen so quickly that many will get “financial whiplash” as they try to figure out what to do with their money. We are moving toward a time of extreme financial instability, and different strategies will be called for at different times. …Right now, we are living in the greatest debt bubble in the history of the world. When a debt bubble bursts, fear and panic typically cause the flow of money and the flow of credit to really tighten up. We saw that happen at the beginning of the Great Depression of the 1930s, we saw that happen back in 2008, and we will see it happen again. Deleveraging is deflationary by nature, and it can cause economic activity to grind to a standstill very rapidly.